Habit: Shrub, glabrous or short- or long-hairy, glandular or not, often smelling of wintergreen, generally rhizomed. Stem: prostrate to erect, rooting at nodes or not. Leaf: alternate, evergreen, leathery, entire to serrate. Inflorescence: raceme, each flower with 1 bract, 2 bractlets, or flowers 1 in leaf axils, each with 4--10 bractlets; pedicel jointed to flower. Flower: sepals generally 5, fused; petals 5, fused, cylindric, urn-, or bell-shaped, white to red; stamens (5,8)10, anthers dehiscing by 2 short, slit-like to rounded pores, awns (0,2)4, sometimes reduced; ovary superior or 1/2-inferior, chambers (4)5, placentas axile, at top. Fruit: capsule, loculicidal or irregularly dehiscing, generally +- enclosed by fleshy, colorful calyx (or a berry and/or with non-fleshy calyx). Seed: few to many per chamber, appendages 0. Stem: erect, generally 2--20 dm, clumped, nonglandular-hairy or not, sparsely to moderately long-glandular-hairy. Leaf: (3)5--13 cm, minutely serrate; base obtuse to cordate; tip short-acuminate to acuminate. Inflorescence: raceme, axillary, glandular-hairy. Flower: sepals glandular-hairy; corolla urn-shaped, glandular-hairy, white to pink; filaments puberulent, anther awns 4. Fruit: dark purple to +- blue-black. 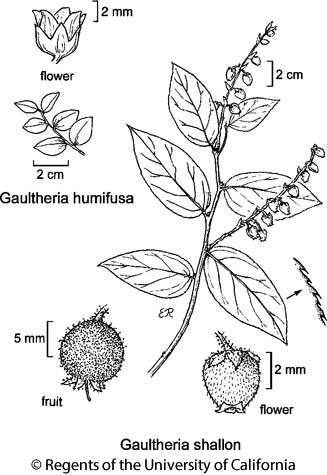 Citation for this treatment: Walter S. Judd 2012, Gaultheria shallon, in Jepson Flora Project (eds.) Jepson eFlora, http://ucjeps.berkeley.edu/eflora/eflora_display.php?tid=26490, accessed on April 22, 2019. NCo, KR, NCoRO, CCo, SnFrB, s SCoRO; Markers link to CCH specimen records. Yellow markers indicate records that may provide evidence for eFlora range revision or may have georeferencing or identification issues. Purple markers indicate specimens collected from a garden, greenhouse, or other non-wild location.